Not much beats sitting in a hot tub when the weather turns a little cool. Sitting outside in the cool air, talking and enjoying your time with friends or family is a whole lot of fun. It’s a great way to socialize and beat the cold for a little longer. 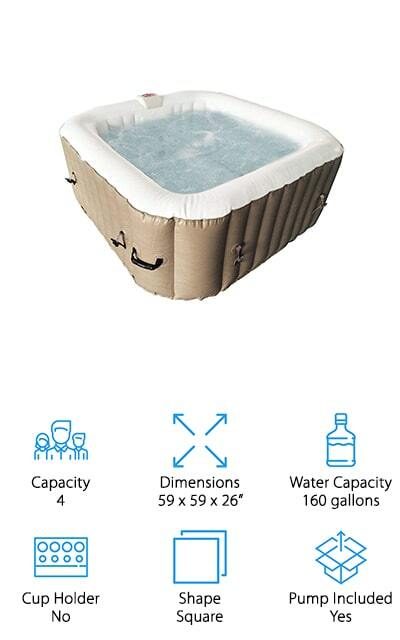 But inflatable hot tubs are starting to become even more popular because of the versatility involved. There’s a whole lot of great things to consider and that’s why we’ve done some extensive reviews on inflatable hot tubs. 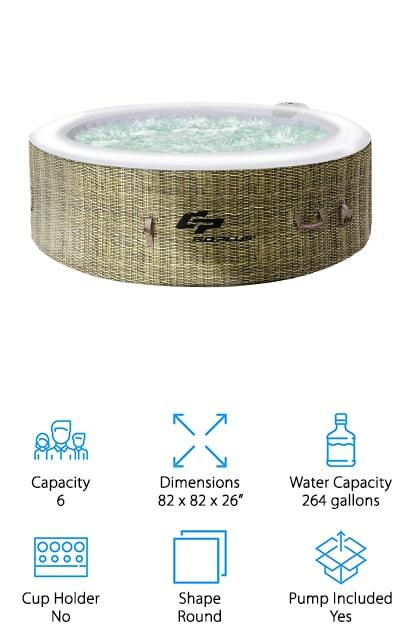 Capacity: How many people can the hot tub hold? This is important because you only get to put so many people in the space. You want to make sure it’s large enough for your largest group of people to enjoy at once. 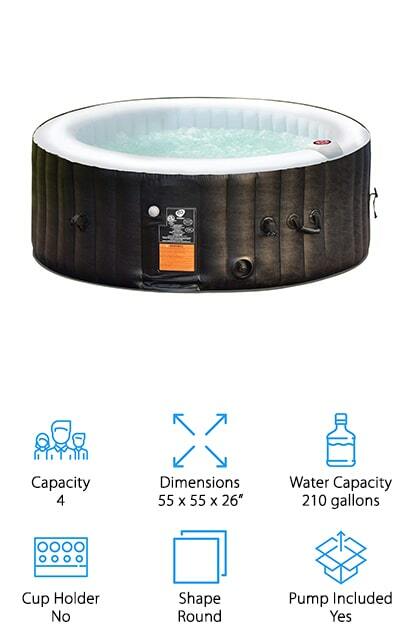 Dimensions: What’s the overall size of the hot tub? You want to make sure it’s going to fit in the space that you have available for it, after all. Too large or too small is going to be a problem for the look and feel that you want. Water Capacity: How much water does the tub actually hold? Making sure that you have plenty of water for what you want but you’re not spending a fortune in water is definitely going to be important, so make sure you have an idea. Cup Holder: Is there a cup holder in the tub? This is a personal preference but for some people it can actually be a very important feature. You want to be comfortable when you’re relaxing in your hot tub after all. Shape: What’s the overall shape of the tub? Is it square? Is it round? Is it something else? The shape isn’t necessarily important other than if it fits in the space and what you’re looking for but it’s something you want to know. Pump Included: Is the pump included or do you need to purchase it separately? Keep in mind that you’ll need a pump of some kind in order to get your inflatable hot tub up and running, so knowing before it arrives is important. So many hot tubs are out there right now, but you want to make sure you have an inflatable one that works for you. Well, we’ve taken the hard part out of the process for you. We’ve actually created a list of the top 10 inflatable hot tubs so you can make sure that you have something you and your family will enjoy all year. Take a look at each inflatable hot tub review and see which one is going to work out best for your needs. Our top pick gives you plenty of the features that you’re looking for from a 4 person capacity to 4 hydro massage jets. You’ll also have 3 different adjustable speeds that you can set manually and 118 effervescent air jets. That means you get some great bubbles and you can feel comfortable in this super inflated, round hot tub. 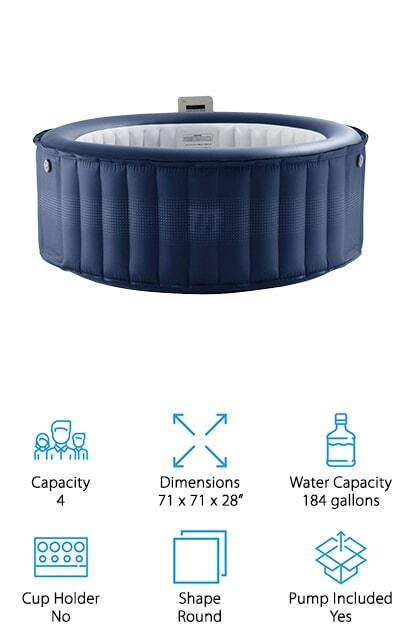 It has a soft ripple pattern on the inside that keeps it comfortable and it works well for those who want to relax and get a little hydrotherapy. You can set this spa up just the way you like it by adjusting the direction and speed of each of the different jets individually. That means everyone is going to have the right level of comfort to enjoy this spa. 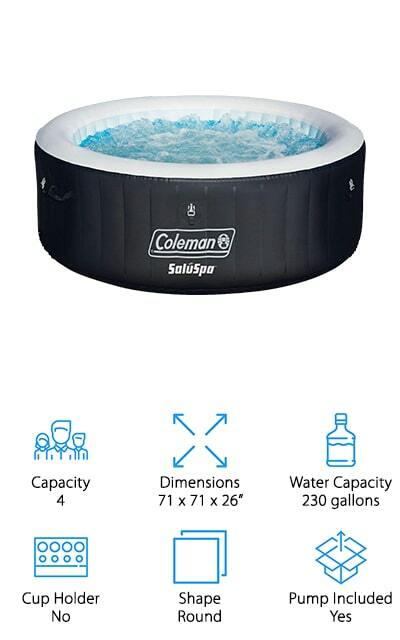 This Coleman spa is one where you should definitely read the inflatable hot tubs reviews. It’s made by a company that’s well known for outdoor gear and there’s definitely a reason for that. It gives you 120 soothing bubble jets to make sure you have plenty of soothing aspects and it fits up to 4 people comfortably. You’ll have everything you need here, including the pump, the heating system, water filtration and a whole lot more. Cushioned and comfortable to sit in for extended periods, you’re going to love having this in your backyard. When you need to replace the filter the cartridges are super easy to replace and the cover keeps the water nice and hot when it’s not being used so you don’t have to use up so much electricity or time getting it ready. This square hot tub is designed for up to 6 people to relax comfortably and it only requires 210 gallons of water to fill it up. Moderately priced so you can definitely pick one out for your backyard, this spa even comes with the filter and everything you need to get it started. You won’t need any tools and you’ll be able to feel comfortable with all the inflation to the sides and the triple layer of material that makes it even more durable. The 114 air jets and the heat and massage jets together definitely help you to relax. You’ll have a leatheroid cover that includes safety lock clips to keep anyone out of your hot tub when you aren’t using it. Not only that but it has a built-in air chamber to keep the heat in. Set up the power saving system to even make sure that it starts and stops just like you want. You’re going to have plenty of features that make this hot tub a great one for your yard and your family. It’s a round spa that uses 290 gallons of water but also provides plenty of space for 6 people. On top of that you can range the temperature anywhere from 68 degrees up to 104 degrees Fahrenheit so you can be comfortable in any weather. There’s a headrest that lets you lean back and really relax and there’s even a cup holder that lets you have a great drink while you’re doing it too. Fill up the tub to your ideal level of firmness to get even more customization and don’t even worry about hard water because this system has a built-in pump and water softener. You’ll be able to relax just the way you want at the end of the day. Sometimes inflatable hot tub reviews tell you everything you need to know and this small hot tub is a great example. It’s a round design that holds up to 4 people comfortably and sets up extremely easy. All you need is the included pump with no tools at all. You can heat it up to 104 degrees Fahrenheit to get a great, comfortable fit and you need 177 gallons of water to get it ready to go. There’s a digital control panel with an automatic timer for start and stop and there are 120 bubble jets that will really help you to relax and rejuvenate. There’s a water filtration system and a chemical floater to keep out debris and any kind of bacteria as well, so you can rest assured your spa is clean and just as fresh as you want it to be. Use the digital panel to turn up or down the heat right from inside and you’re ready to go. This square hot tub offers 132 effervescent air jets that give you plenty of massaging bubbles. Even better, the tub itself is large enough to hold 6 people comfortably and is made with 6 layers of reinforced PVC to make sure that it’s heavy duty and durable enough to withstand normal use. There’s a four hour auto filtration system that makes sure the water is always clean and clear when you want to use it and there’s even a safety buckle for the cover that makes sure small children aren’t going to get in without your knowledge. The pump you need and everything else is included here so all you need to do is hook it up and get the water flowing in. 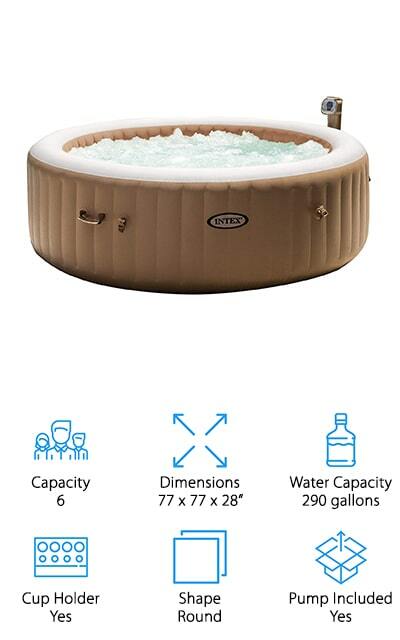 Before you know it you’ll be able to really start enjoying your hot tub on your own or with your friends. This 6 person tub actually comes in 3 different colors so you can get the ideal design you’re looking for. 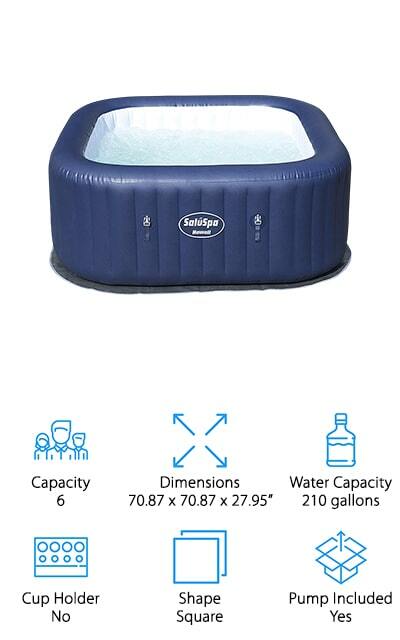 It’s round and holds 210 gallons of water to give you the most comfortable soak. User friendly, all you have to do is use the control panel to set the temperature that you want and get it started so you can have a whole lot of fun and a great relaxing time. The pool itself is made with fabric coated materials and there’s insulation throughout that keeps the heat in. There’s also a filter cartridge that makes sure the water is always clean and it’s super easy to replace. If you have hard water there’s also a hard water treatment process built in with the pump so you don’t have to worry about the way the water feels on your skin. You’ll have a foil and zipper cover with safety locks to keep everything and everyone out of this pool when you’re not using it. With this square hot tub you’re going to have plenty of space for up to 4 people at the same time. It’s smaller than some, with only 160 gallons of water, but it’s still going to be great for those who need help with joint and muscle pain or who just want to relax. Made with a thick PVC material to keep it strong and durable, this system also comes with the pump and everything else you’ll need to get it up and running. All you need is the water. 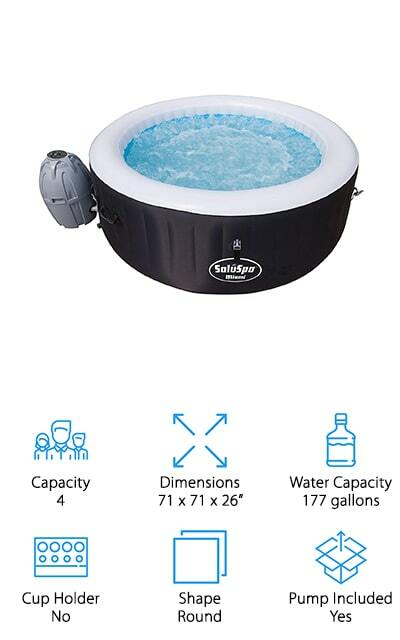 Not to mention you’ll get the bubbler and the hot tub cover that you need to really get a great experience. 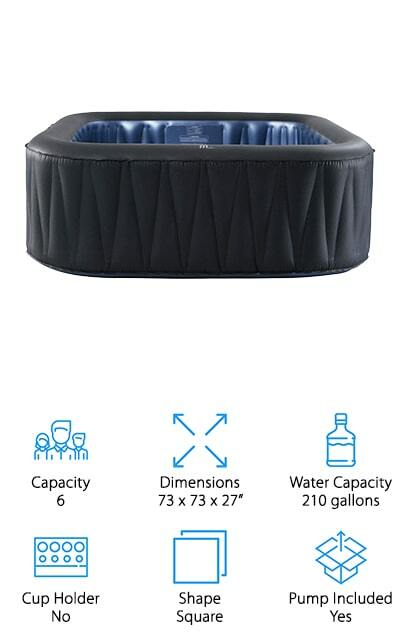 Whatever you’re looking for you’re going to have a great experience hanging out in this hot tub and you won’t have to spend a lot of time filling it either with the smaller capacity. Just set the digital controls to what you want and you’re ready to go. This hot tub is round in design and gives you plenty of bubble jets to get you feeling relaxed and ready for anything. It has everything you need included, even the pump, so all you need to do is fill it up with water and you’ll be all set. The digital control lets you set the temperature and make sure everything is running just right and the fact that you can fit 4 people in here definitely makes it fun and more comfortable. You’ll have a fabric coated material around the exterior that keeps it safe and durable and you get a built-in hard water treatment system. When you relax into this tub you’re definitely going to see why it’s so popular and why it’s a great option for your yard. It has a simple to replace filter and it’s actually easy to inflate or even deflate and store or take somewhere else. Looking for the best inflatable hot tub for winter? This might be just what you’re looking for. This round hot tub includes the pump and everything you need to get started, including the filter cartridge and hoses. All you need to do is fill it up with 264 gallons of water and you’ll be ready to go. Heat it up to as much as 104 degrees Fahrenheit and enjoy the built-in hard water treatment system as well. Able to hold up to 6 people comfortably this is a great way to relax after a long day. You can use this tub indoors or outdoors and you can feel comfortable with the durable materials that it’s made of. Available in several different colors to fit your personal preference, this is definitely a tub that will keep you more than happy with a 360 bubble design for comprehensive massage.